The email started like many we receive: What dates are the library computers available to bring down classes for research? We check the schedule and start to email a response when it hits us …a math teacher…wants to do research? What?! We quickly respond with dates as requested and offer to help in any way we can. Then Ms. White, my librarian colleague, and I start chatting from our desks to one another. Ding…then another email arrived with an attachment of the math research project Ms. Zehnder had done at a different school but she wanted to make it better and asked for our help, perhaps using the Guided Inquiry Process. And that is how we became part of another Guided Inquiry Design (GID) unit at HCHS. The three of us began collaborating to design a student-oriented research project and by late fall, students began their inquiries, and for many of them, this was the first math research project they had ever been assigned. So, what did it look like? Open – Students were asked to think about ways they use math in the real world. With a little prompting from the classroom teacher, the examples started pouring in. Perhaps the most powerful point about this phase was once they started thinking about math in the real world, they understood it was all around them. 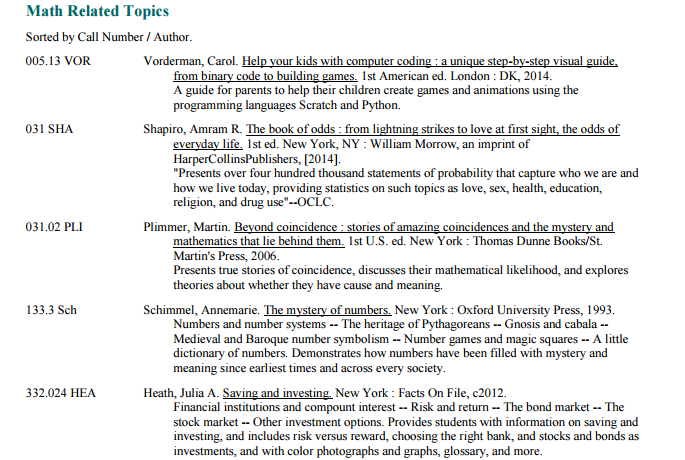 To help with this phase, as librarians, we brainstormed a list of ways math was relevant in their world and gave it to Ms. Zehnder although it wasn’t really needed. The list came in handy later though as we worked to find resources to flesh out the Explore phase. 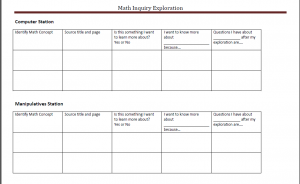 Immerse– Using a high interest article in the classroom, the class found as many math related concepts as they could within it. Afterwards, as a group, they discussed how one might use it as a springboard to come up with inquiry topics for a research project. As school librarians, our role was to find a handful of possible articles and gave them to the Ms. Zehnder so that she could determine which one(s) she wanted to use. Having the classroom teacher model the process of reading articles and talking about real life experiences, then brainstorming how math was relevant to it, was a great way to scaffold the class for the Explore phase. Explore – Next, students came to the library and participated in exploration stations to make connections with mathematical concepts used in the real world and think about how math affects their daily life. There were 4 stations: books, magazines, computers and manipulatives. Students spent 9 minutes at each of the stations looking through whatever materials caught their eye and filled out the Exploration handout as they went. There was enough time at the end of the period for students to return to any station(s) they wanted to explore longer. At the book station we had over fifty resources scattered around for students to pick up and flip through. Topics ranged from specific sports, to nutrition, to world records, to teen spending practices and more. A complete bibliography is below in case you’d like to look at it further. The magazine station included the local newspaper and a variety of magazines like: Transworld Skateboarding, Popular Science, Outdoor, Time, National Geographic, ESPN and others. By far the two most popular stations were manipulatives and computers. At the manipulatives station, we set out the Cracker Barrel peg game, Suduko sheets, mandala coloring sheets, the Banagrams game, dice, etc. Watching students at this station made me so happy. Not only were students trying their hands at origami, wrestling with math brain teasers, playing Connect Four, etc. they were having real conversations about math and enjoying it! The computer station was very engaging too. 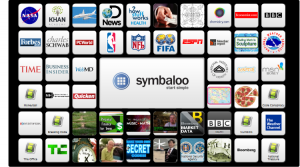 Ms. White spearheaded this station by creating a Symbaloo webmix housing a variety of websites for students to explore and determine how math was involved. 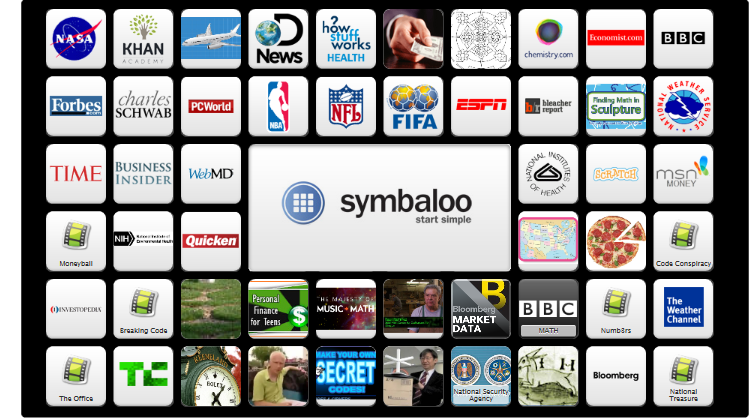 Check out the Explore link below when you have time because the mix of videos, websites and tutorials gave students plenty to consider in this station too. The beautiful thing about this portion of the GID unit was that I learned a new technology tool out of it too! Identify – During this phase, we as librarians visited the classroom to lead a mini-lesson with each class. With their completed Explore Station handout in front of them, students selected a mathematical concept they found interesting to focus on for the rest of their project. 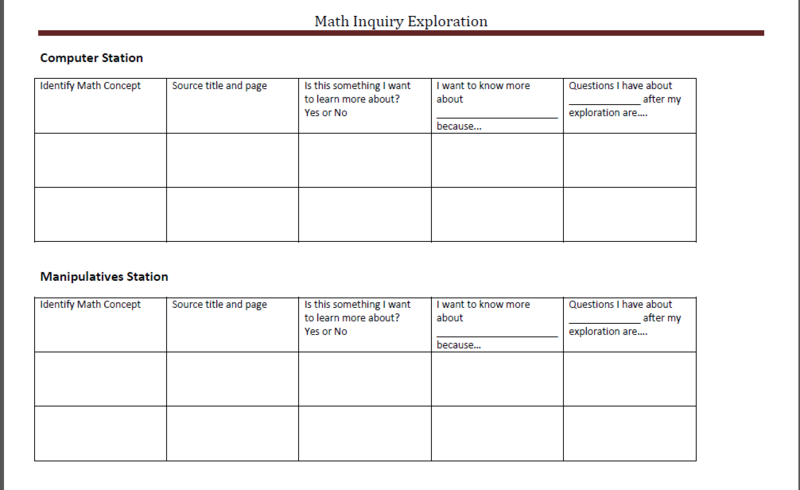 While students were not required to select a topic from the Explore phase, many of them did so and having a series of possible topics in front of them, allowed everyone to have something to work on during this lesson. After we modeled how to take a topic and brainstorm possible inquiry questions, we gave the students time to complete theirs. 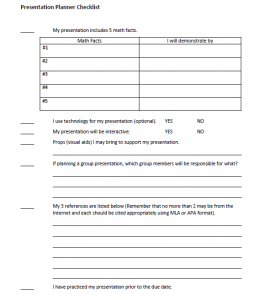 Note there are two graphic organizers. We did this knowing some learners are linear thinkers and others are not. 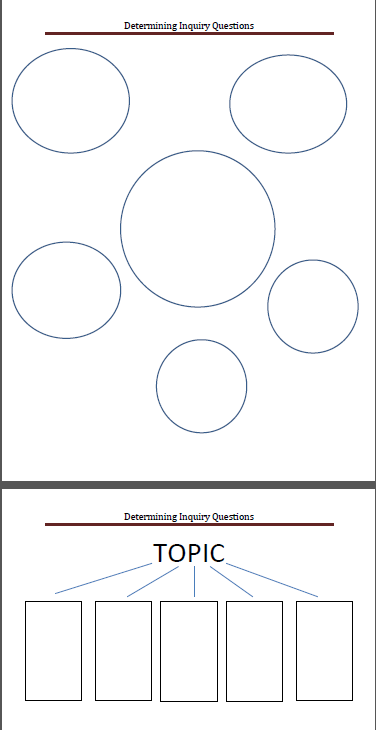 Our hope was that a student could select the one that best helped them organize the topic and potential keywords and related inquiry questions related to the main idea. We modeled both types of graphic organizers with the students. Ultimately the topics students selected were quite varied including: how math drives the game of hockey, why an understanding of math helps mixed martial arts fighters get an upper hand in a match, why the number zero is relevant, why do we need to understand the concept of infinity, just to name a few. Gather – The next time students came to the library, we (librarians) demonstrated how to take notes on relevant resources as it related to their inquiry. 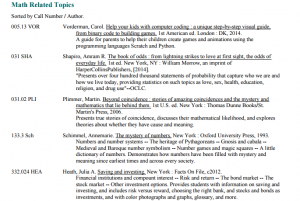 Students were required to use both print and web-based resources to research their mathematics concept. 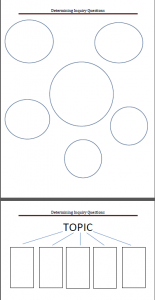 As librarians, we created and provided an Inquiry Log template including links to citation help where students could answer their inquiry questions as they researched. Before turning them loose to conduct their own research, we modeled the process using the template. During the student research time in the library, Ms. White, Ms. Zehnder and I circulated around the room to assist students with locating potential print and web resources, and generally helped them stay on task. In reflection, it was clear students loved talking and sharing what they were learning about their topics and were eager to share that with anyone who would listen. Students who did not complete this phase during allotted time in the library were required to finish it independently. Create – Students were eventually tasked to create a presentation where they would explain the mathematical concept they chose, provide examples of how it is seen or used in real life and find relevance for its mathematical study. As librarians, we helped students think through possible presentation types. When PowerPoint was mentioned, we tried to talk about the pitfalls of a traditional presentation format and how to avoid it. Suggestions included not reading from the slides directly, embedding pictures or videos, and how to narrate using audio clips. At first students seemed frustrated by the lack of specific requirements given for the presentation. They wanted to know which presentation format was best, how long it should be, etc. In hindsight, I would definitely not change this aspect of the project because it helped students truly consider which format would be best for their particular topic and their particular audience. The varied results spoke to the wisdom of leaving the presentation format open. 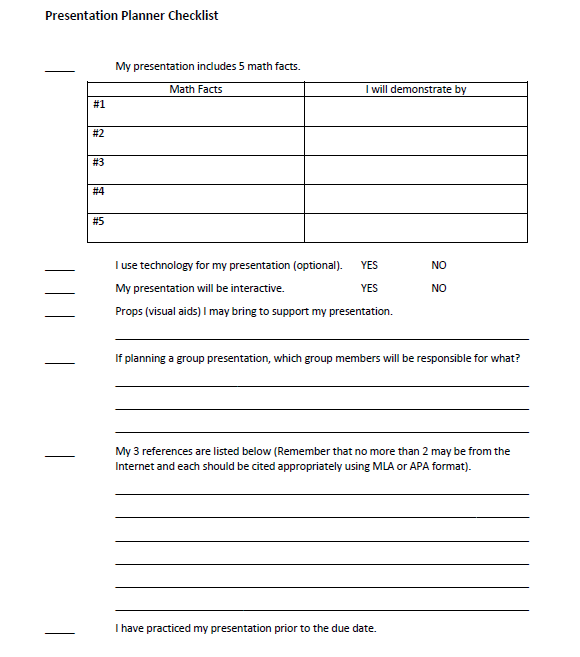 On the final day of class time given to work on the presentations, we did create and give students a Presentation Planner Checklist to help students organize themselves and know at a glance what else needed to be done or strengthened to ensure success. Share – Students ultimately shared their presentations and were graded based on whether their visual and verbal presentation addressed the mathematical concept, clearly defined and explained it, gave examples of the concept in real world and discussed the relevance of studying the concept in general. The diversity of the final products was greater than I had originally expected. Sure, there were still a lot of PowerPoint presentations but not exclusively. Interestingly, if Ms. White and I got sidetracked in the library during one of the presentation times, it wasn’t unusual for a student to inquire where we were and ask to call and remind us to come up. How cool is that? We were absolutely thrilled to be part of the process from beginning to end. Ms. Zehnder not only invited us as school librarians to the Share phase, she invited all building math teachers and administrators too. Students were both pleased and proud to have additional audience members. We even invited a Communications person from the district office who wrote a feature article on the district website. Check it out! Evaluate – The classroom teacher, Ms. Zehnder, evaluated each project based on the rubric that specific class had made. For example, every class was evaluated on incorporating five math facts, citing their sources and discussing the concept’s relevance but she had also allowed each class to individualize their rubrics. Some classes added a creativity component, others bonus points for audience participation, etc. We intended to have students complete a self-reflection on the project using a Google form but due to lack of computer availability, this wasn’t possible. Instead, students debriefed in a class discussion. In the future we hope to use the Google form, as it is a great way to collect and analyze data in a timely manner. The positive press by the district combined with teachers hearing about our project by word of mouth has led others to express interest in developing a GID unit of their own in collaboration with us. Perhaps by the end of the school year we will have more units to share. Way to go on this unit! I mean just starting out… rocking this in MATH content and then getting noticed by the district! WOW!